Improvised explosive device wounded two elements of the Syrian Democratic Forces on a road north of Raqqa city. Hayat Tahrir al-Sham and Al-Jabhat al-Wataniya lil-Tahrir (National Liberation Front) reached an agreement ending their clashes at a checkpoint in the vicinity of Tell Manas near Jarjanaz. According to the agreement, Al-Jabhat al-Wataniya lil-Tahrir’s Suqour al-Sham will dismantle its checkpoint, which provoked yesterday’s attack by Hayat Tahrir al-Sham on it. The said checkpoint will be re-established at a different location in the area without interfering with Hayat Tahrir al-Sham’s activities. The two sides will also release all detainees. 1- Baguz axis: In the early hours of the morning, there were movements of the terrorists so our fighters targeted them and violent clashes broke out in six locations in which the terrorists used heavy and light weapons. One of their vehicles tried to escape, but it was targeted by our fighters, and that resulted in killing whoever were inside it and a terrorist carrying a PKC weapon was killed. Our fighters also targeted a terrorist gang with mortars. The killing of three terrorists was confirmed. The Global Coalition’s Obis cannonry bombarded several terrorists’ sites, but we could not know the results. The Coalition’s aircraft launched several intensive raids targeting the terrorists’ sites and fortifications. In the evening, the terrorists attempted to launch a counter-attack against the points of our fighters from two axes, and clashes which were the most violent broke out in the center of al-Soseh town which the elements of the terrorist organization tried to break into and break the defensive lines of our forces, but our fighters repelled and killed a large number of terrorists while the rest fled. The terrorist organization attempted to gather up its ranks and launch another counter-attack against our fighters’ points, but that was foiled as well after strong clashes erupted against the attacking terrorists amid aerial raids launched by the International Alliance’s aircraft on the terrorists’ positions. As a result of those clashes, a large number of terrorist elements were killed as the bodies of 10 mercenaries were kept at the hands of our fighters. The terrorists tried to penetrate the ranks of our forces by using a number of car bombs and the military armored vehicles, but our fighters confronted and managed to detonate one of them while the others fled the battlefield. Our fighters targeted two terrorists wearing explosive belts, killed them before reaching our fighters’ points and seized their belts and weapons. 2- Hejin axis: This axis is still witnessing intermittent clashes interspersed with mutual shelling with mortars in addition to attempts by the terrorist organization to launch attacks on our fighters’ points, but all of them are foiled due to the vigilance of our fighters and monitoring all the movements of terrorists. – The number of terrorists’ killed: 51 terrorists, the bodies of 10 of them were kept into our fighters’ hands. – The terrorists’ losses: A car bomb and a military vehicle were destroyed. – The weapons seized by our fighters: 1 PKC, 2 explosive belts and a number of Kalashnikov rifles. – The raids of the Global Coalition’s aircrafts: 18 raids. – The number of rockets launched at the terrorist positions: 7 Hummer missiles. 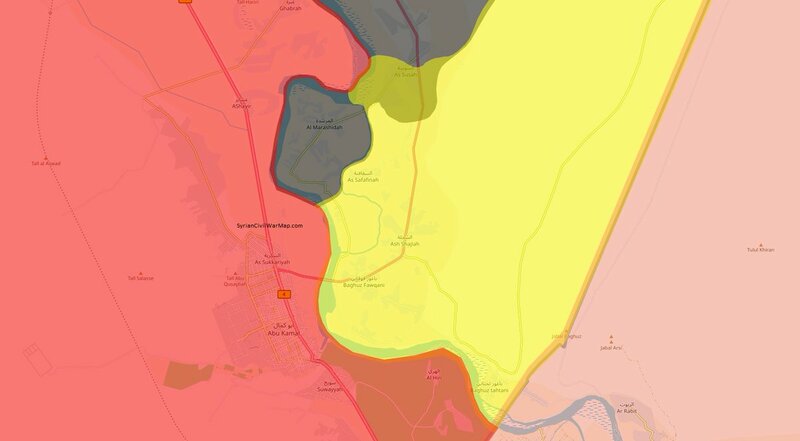 Syrian Democratic Forces’ Asayîş (Security) arrested three individuals on charges of previously belonging to the Islamic State in the city of Dhubyan in eastern Deir al-Zour. Two improvised explosive devices killed two and wounded five civilians on a road in Al-Tiha area near the village of Al-Shawkatliya. Islamic Emirate of Afghanistan’s (Taliban) sniper killed an element of the Afghan National Army in Yaka Pasta area of Qaysar district. Afghan National Security Forces killed five and wounded seven elements of the Islamic Emirate of Afghanistan in Keran wa Menjan district. Islamic Emirate of Afghanistan’s Al-Emarah News claimed that an Afghan National Army’s commander and 70 elements of the army defected to the group in Keran wa Menjan district. Afghan National Security Forces killed three and arrested one element of the Islamic Emirate of Afghanistan in Kharwar district. Afghan National Security Forces killed four and wounded three elements of the Islamic Emirate of Afghanistan, as well as seized several weapons depots and ammunition caches in Farah district. Islamic Emirate of Afghanistan’s improvised explosive device destroyed an Afghan National Army’s armored personnel carrier in Noorak area of Qalat district. Islamic Emirate of Afghanistan ambushed an Afghan National Army’s patrol on a road towards the capital of Helmand Province, Lashkar Gah. Two elements of the Afghan National Army were reportedly killed in the ambush. Islamic Emirate of Afghanistan’s snipers killed five elements of the Afghan National Army in Spin Tameer area of Miyanishin district. Afghan National Army’s element surrendered to the Islamic Emirate of Afghanistan with his weapon in Miyanishin district.